LOUIS MARX INDUSTRIES (CANADA) LIMITED. Secondly, the model railways are being being distributed by a 'newly created' HORNBY RAILWAYS DIVISION. 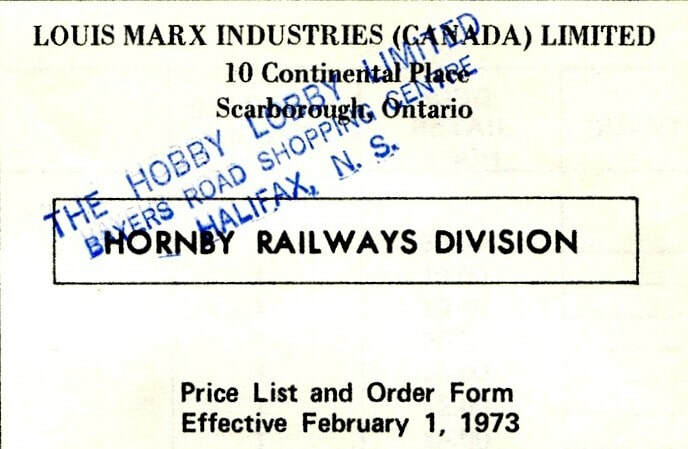 And, it is also interesting to note that although the 1973 Hornby Railways Canadian Catalogue illustrated six new Train Sets, no sets of any kind were listed in this Price List and Order Form. 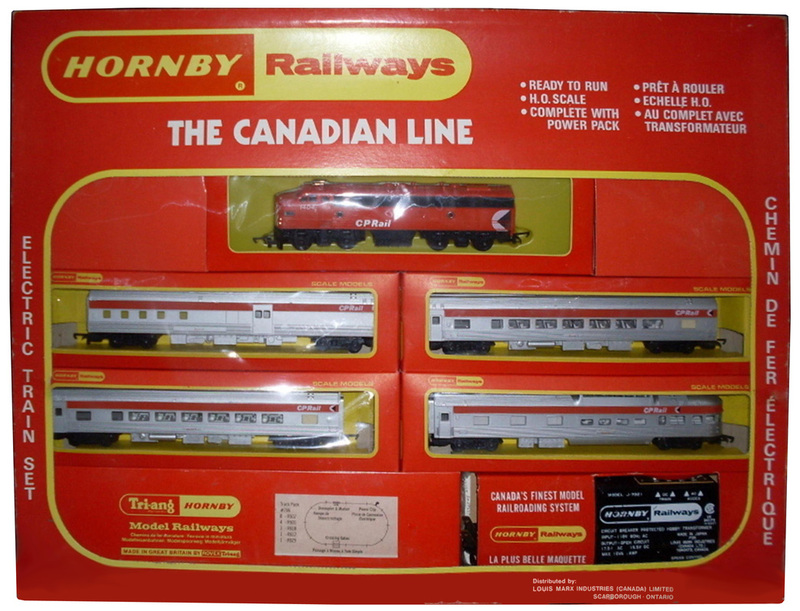 The 1973 Edition of the Hornby Railways Canadian Model Railways Catalogue illustrated six new train sets which were proposed to be introduced in 1973. The sets were not listed in either the 1973 or the 1974 Price Lists. Up until recently, there had been no evidence available to suggest that any of the sets illustrated in these catalogues were ever assembled or issued. It is not known whether all of the above sets were actually issued. 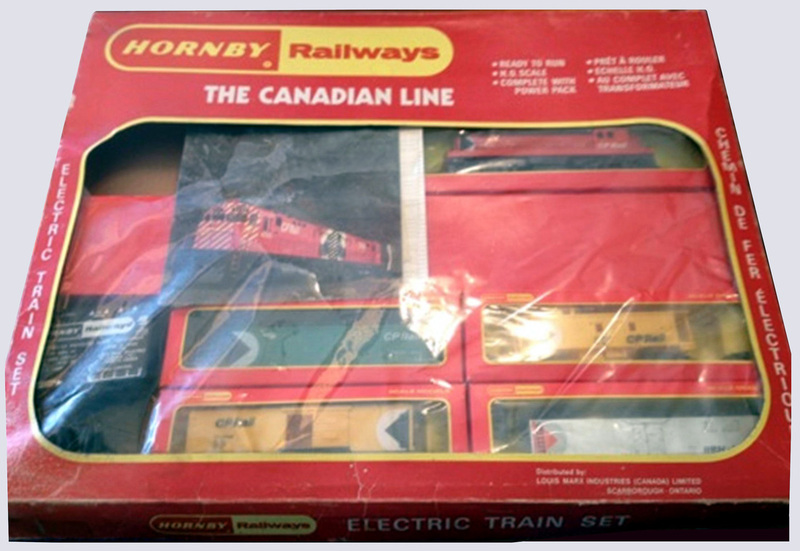 The majority of the Canadian 1973 - 1974 Sets were released in this attractive new style Hornby Railways window box packaging but, surprisingly, not all ! 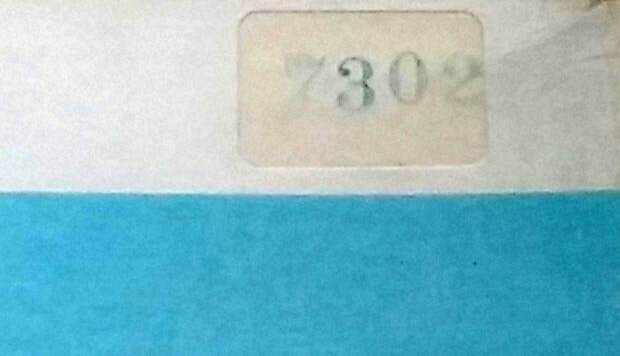 In a recent discovery, an example of a 1973 Set was released in the 1972 Revised Style Set Box which was used for a very short interim period. 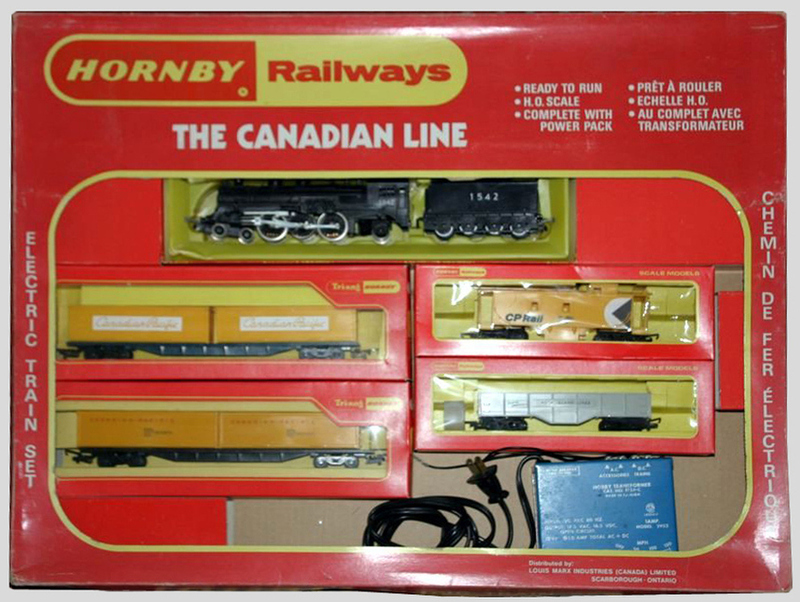 The first thing that is noticeable about the box lid is the 'HORNBY Railways' logo with 'THE CANADIAN LINE' immediately below it. These are the only known sets to carry these inscriptions. The box appears to be a ‘generic’ set box which was used for all of the issued sets with various different packing pieces as required. There is no provision on the box lid for a set reference number, set name, contents description or price. The set box is surprisingly large, measuring 25 inches wide x 19 inches high x 2 inches deep. It is almost certain that the set box was shrink-wrapped therefore any price labels would have been lost when this was removed and discarded. Also, there is no plastic pre-formed inner tray and the set contents are individually boxed; except for the transformer which has its own individual packing piece. Clearly Set No. 7301 was intended as a 'Starter Set'; being a cheap introductory set to encourage youngsters into the model railways hobby. No examples of this set have been recorded. 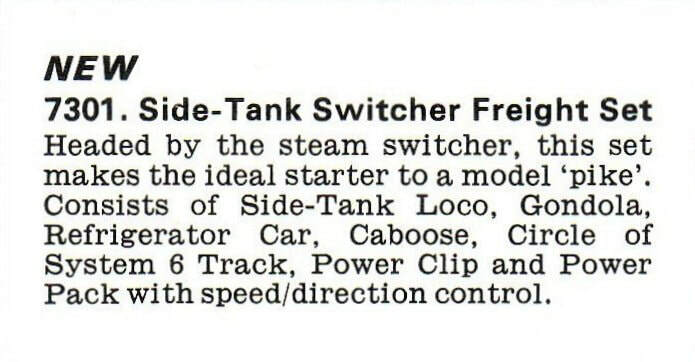 R.755 Side-Tank Switcher, R.1160 Rock Island Lines Gondola Car, R.1291 CN Refrigerator Car, R.1151 CN Caboose, together with a Model 1000 Transformer and R.707 Track Pack (oval of System 6 Track including 4x R.600 Straight Track, 8x R.605 Double Curved Track Small Radius and R.618 Power Connecting Clip). Please note: in the 1973 Canadian Catalogue, the English set description of the track contents describes it as being a 'circle' whereas the French set description describes the track as being a 'circuit ovale' (oval circuit). It is quite possible that a circle of System 6 Track may have been included in the set - Track Pack R.705 (8x R.605 Double Curved Track Small Radius and R.618 Power Connecting Clip) or a small oval. 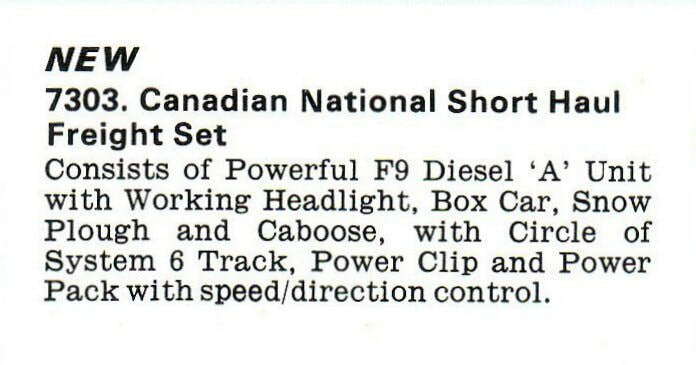 It is not believed that there was a plastic pre-formed inner tray in the box - no previous Canadian Sets contained an 0-6-0 Diesel-Electric Shunter / Switcher. As with all the other 1973-1974 Sets, the set contents would have been individually boxed; including the transformer which has its own individual packing piece, plus various additional cardboard packing pieces to hold the set contents in place. 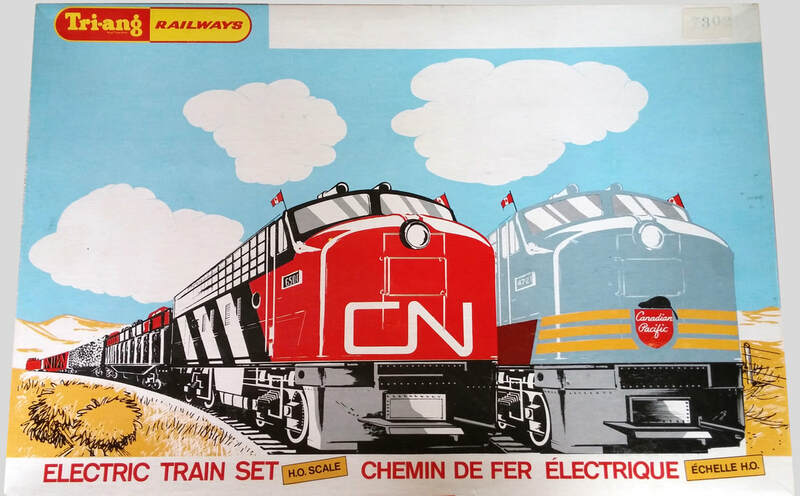 The set illustrated in the 1973 Canadian Catalogue consisted of the R.0551 CN Diesel Locomotive, R.1361 CN Box Car, R.1151 CN Caboose, R.1381 CN Snow Plough, together with a Model 1000 Transformer and R.707 Track Pack (oval of System 6 Track including 4x R.600 Straight Track, 8x R.605 Double Curved Track Small Radius and R.618 Power Connecting Clip). 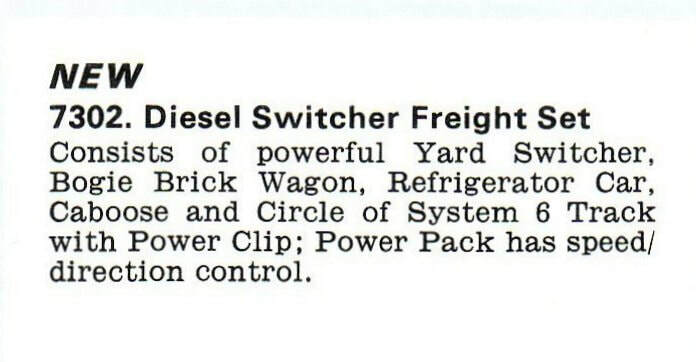 The issued set consisted of the R.1553 CP Rail Diesel Switcher, R.1353 green CP Rail Newsprint Car, R.1343 yellow CP Rail Box Car, R.1293 silver CP Rail Refrigerator Car, R.1153 CP Rail Caboose, Model 1000 Transformer, R.629 Single-track Level Crossing and R.706 Track Pack (a large oval of System 6 Track including 4x R.601 Double Straight Track, 8x R.607 Double Curved Track Large Radius, R.617 Uncoupling Ramp and R.618 Power Connecting Clip). Also included in this particular set were the 1973-74 Edition of the Canadian Catalogue and the 1973 Price List. The Hornby Railways Operating Instructions included with the Diesel Switcher in the set is stamped 'R1553 220373' which, together with the price list, would tend to confirm the set to be of 1973 vintage. The pictured set contents are not complete. 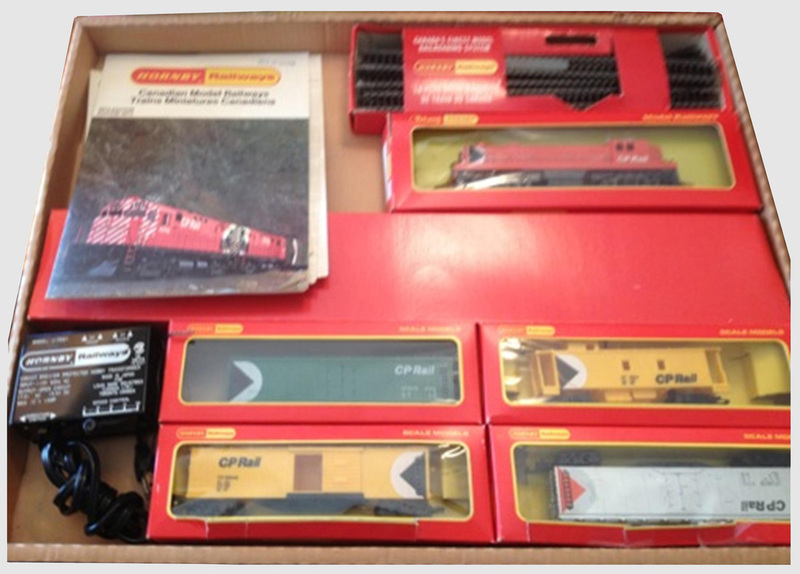 Note the mix of Tri-ang Hornby and Hornby Railways boxes which appears to be correct. 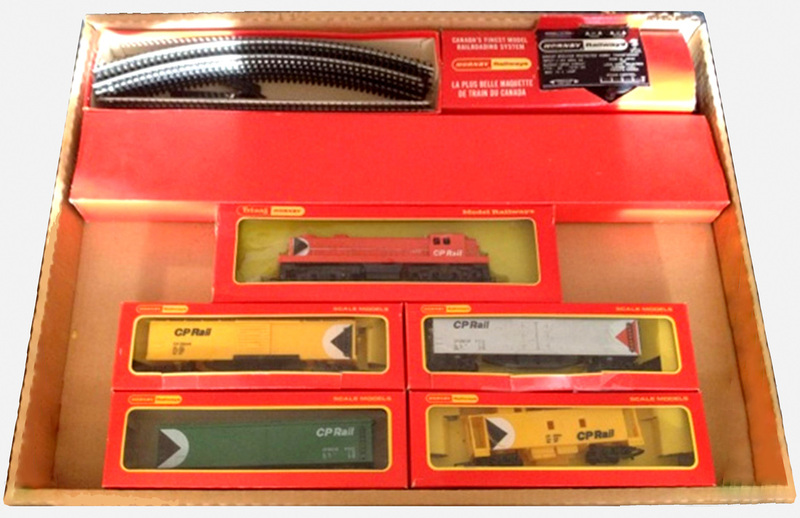 The issued set consisted of the R.0553 CP Rail Diesel Locomotive, R.4423 CP Rail Baggage Car, R.4403 CP Rail Passenger Car, R.4433 CP Rail Dining Car (Diner), R.4413 CP Rail Observation Car, Model 1000 Transformer, R.629 Single-track Level Crossing and R.706 Track Pack (a large oval of System 6 Track including 4x R.601 Double Straight Track, 8x R.607 Double Curved Track Large Radius, R.617 Uncoupling Ramp and R.618 Power Connecting Clip). The illustration on the R.706 Track Pack box (bottom left) detailing the track pack contents and showing a diagram of the track layout included in the set. Note: the passenger cars, in this particular set, are all the second-issue (Type 2) cars - correctly named 'Banff', rather than the incorrect spelling 'Danff'. The set illustrated in the 1973 Catalogue consisted of R.0542S Pacific 4-6-2 Steam Locomotive and Gresley Tender No.1542, R.2350 International Logging Co. Pulpwood Car, R.667 100 ton BOC Liquid Oxygen Tank Wagon, R.1350 Newsprint Box Car, R.3423 CP Rail Car Transporter with Six Minix Cars, R.1153 CP Rail Caboose, Model 1000 Transformer and R.708 Track Pack (a large 'figure of 8' circuit of System 6 Track with R.618 Power Connecting Clip). The pictured set consists of R.0542S Pacific 4-6-2 Steam Locomotive and Gresley Tender No.1542, R.7352 Flat Car with 2 x Canadian Pacific 30ft Containers, R.7360 Flat Car with 2 x Canadian Pacific Sea Containers Inc. 30ft Containers, R.1160 Rock Island Lines Gondola Car, R.1153 CP Rail Caboose and Transformer. The Locomotive and Freight Cars as illustrated may well be correct for this particular set since, by the end of 1973, the Canadian factory was running short of stock of some individual models. Other models would have been substituted into sets as required to fulfill orders from retailers. See the proviso printed in the 1973-74 Edition of the Catalogue (illustrated above). How original the blue Transformer is, is questionable. The Transformer is identical to the Life-Like Trains T-615 Hobby Transformer but without the 'Life-Like Trains' logo printed top left. However, a number of these transformers have turned up in several late issued sets and one wonders if stocks of the black Model 1000 Transformer had been exhausted at some stage and these un-named blue transformers were included in sets as a temporary substitute. Note: I am aware of the existence of one other set, in this style of packaging, which includes the Pacific Steam Locomotive. It is hoped to illustrate this set at a later date.